Handy Cosplay Material: Plastimake « Adafruit Industries – Makers, hackers, artists, designers and engineers! I’m always keeping my eyes open for new materials to use in cosplay and building, and someone tipped me off to Plastimake. It comes in a jar of small plastic pellets and looks simple to use: you pour the pellets into hot water, wait for them to soften, pull out the lump of plastic and shape it into whatever you want, and dunk the finished sculpt in cold water to set it. You can put it back in hot water and start over as often as you want, but if you leave it as is, the hardened material is sturdy. It’s non-toxic and not messy and can be used to make toys, tools, jewelry, and in cosplay. Acrylic and spray paints work on the plastic surface. I see potential. You could turn the Plastimake into crowns, armor embellishments like spikes, jewelry pieces, and more. The only down side I see is that you might not be able to get the kind of detail you can achieve with something like polymer clay. LiN, a.k.a. KyOMiii, used Plastimake to see the spikes on the skulls on her Sylvanas Windrunner pauldron. 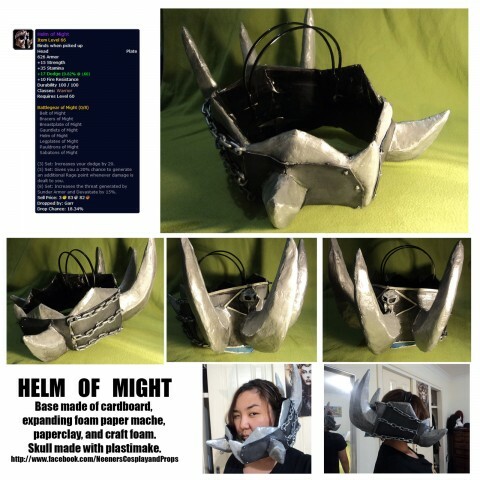 Janina Gabrielle J. crafted the skull on the back of the helm with Plastimake and also used the material to hold the headband and wires in place. 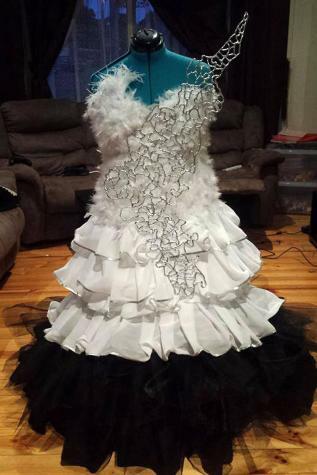 Lisa used Plastimake to create the silver embellishment on Katniss Everdeen’s wedding dress. More examples of Plastimake in use at their website. Is this the same stuff as ShapeLock?